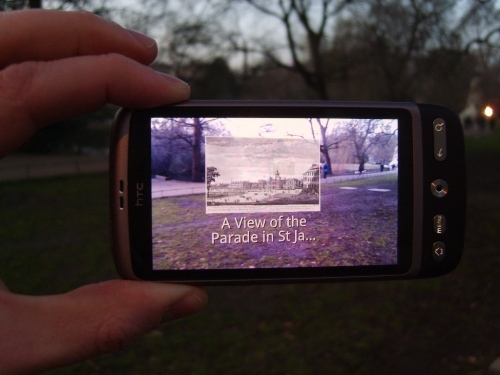 Last month the Museum of London gave a sneak preview of their new app, Dickens Dark London. It uses an interactive map of Victorian London which can be superimposed on to a map of today’s mean London streets and combines this with short graphic novel-style interactive books illustrated by David Fodvari and narrated by actor Mark Strong. Basically it looks frickin’ cool. The launch of the Dark London reminded me that I still hadn’t used their StreetMuseum app, although it been sitting on my smart phone for a while. 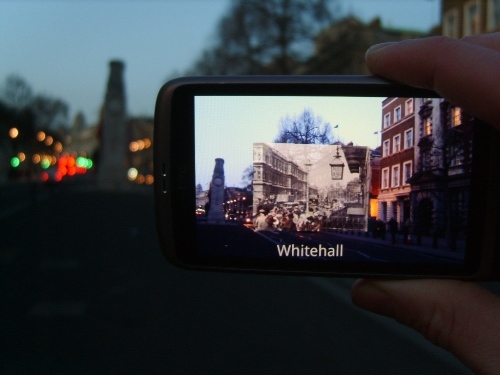 StreetMuseum is a free app for smartphones that overlays images of London from the Museum’s collections onto your phone so you can look at them when walking around town. It’s a great way of museums getting collections that would normally be sat in stores or on display in the galleries out into the world, allowing us to explore the everyday and appreciate just how the cities we live in change so rapidly. Despite losing all feeling in my fingers while trying to take a picture of the picture on my phone, I found the app really easy to use and did enjoy comparing the past with the street scenes in front of me. So if you’re in London and want something free to do on a nice day out, this isn’t a bad way of exploring the capital and seeing it in a new light. Of course, the Museum of London isn’t the only cultural organisation experimenting with new technologies to get visitors to engage with collections in new ways. The British Museum has been testing augmented reality to create a new gallery experience and other museums are doing the same. Sydney’s Powerhouse Museum has an app that shows Sydney as it was 100 years ago and they’ve also developed self-guided walking tours, including the Sydney Heritage Pub Crawl. In Berlin there’s Berlin 3-D, an app similar to StreetMuseum that uses augmented reality to superimpose a rendering of the Berlin Wall onto the reality you’re staring at. At IWM we’re testing the use of QR codes in our galleries, and this is all getting really exciting for museum professionals like me – i.e. geeks who really need to get out more – because of the many possibilities for just getting our content and collections to our visitors in more engaging and accessible ways. However, I’m yet to be convinced that the use of a mobile app either on a tablet device or smart phone can really enhance the visitor experience within the confines of museums and galleries until a device isn’t so conspicuous as to actually detract from the object or artwork you’re interested in. But the technology is slowly getting there. Until it does become less intrusive, however, I’d recommend taking a look at your local museums website to see what they’re up to. You’ll be surprised at what’s out there, and hopefully discover something that can make your trips around town a little bit different. This entry was posted in Miscellany on February 16, 2012 by Paul Scraton.